The new DNC chair opposed voter-ID laws, investigated police misconduct, and protected workers’ rights. Tom Perez could’ve been attorney general if Hillary Clinton had been elected president. Instead he’ll be chair of the DNC. Conventional wisdom portrayed the race for DNC chair as a rerun of the 2016 presidential campaign, with Perez as the corporate establishment and Keith Ellison as the insurgent progressive. That narrative was greatly overstated. While I preferred Ellison as DNC chair, Perez has a strong and impressive progressive record, especially on civil rights. As head of the Justice Department’s Civil Rights Division under President Obama from 2009 to 2013, Perez challenged strict voter-ID laws in Texas and South Carolina, sued Maricopa County Sheriff Joe Arpaio for racial profiling and objected to Arizona’s anti-immigration SB 1070, investigated police misconduct in a record number of cities, and rebuilt the Civil Rights Division after rampant politicization during the George W. Bush Administration. Following that, as Obama’s labor secretary, Perez expanded overtime for 4 million workers and championed the Fight For $15 movement. Mary Kay Henry, president of SEIU, called Perez “one of the finest labor secretaries since Frances Perkins,” referring to FDR’s labor secretary. Perez is also the child of refugees who fled political persecution in the Dominican Republic. Perez’s first task will be to revitalize the party internally—boosting forgotten state parties with a new 50-state strategy, repairing the breach that exists between the DNC and grassroots activists who are bitter about the Debbie Wasserman Schultz era, and channeling the resistance against Trump into electoral results. Perez doesn’t have the political experience of someone like Ellison, so time will tell if he’s up to the job. 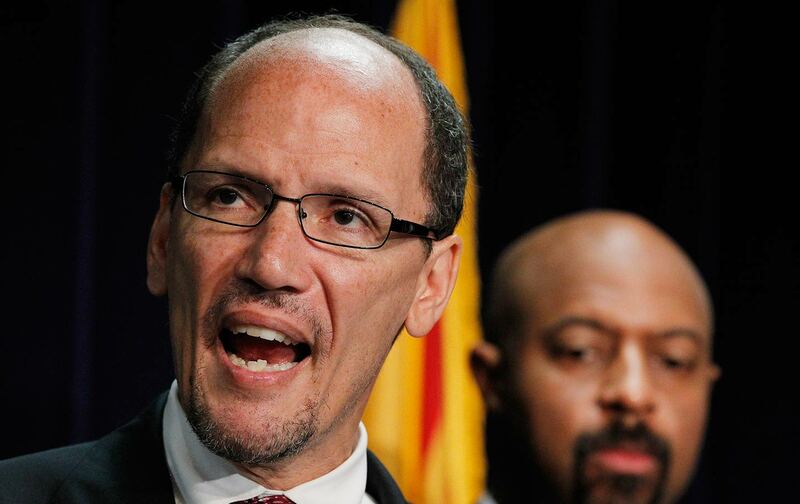 But at a moment when Democrats are searching for leaders, Perez can powerfully take on the Trump administration on issues like voting rights, policing, immigration, and the economy. For progressives upset about Ellison’s loss, Perez is a pretty darn good second choice.